SIP 2007 will be comprised of the following 3 symposia: 1. Signal Processing and Applications (SPA 2007) 2. Acoustics, Speech Processing, and Applications (ASPA 2007) 3. Image Processing and Applications (IPA 2007). 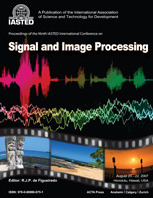 1) IASTED International Symposium on Signal Processing and Applications (SPA 2007) - * Detection and Estimation of Signal * Parameters * Signal Identification * Nonlinear Signals and Systems * Time-Frequency Signal Analysis * Signal Reconstruction * Spectral Analysis * Filter Design and Structures * FIR Filters * IIR Filters * Adaptive Filters * Multi-Channel Filtering * Signal Noise Control * Multiple Filtering and Filter Banks * Fast Algorithms * Adaptive and Clustering Algorithms * Fast Fourier Transforms * Discrete Cosine Transforms * Discrete Hilbert Transforms * Wavelet Transforms * Array Signal Processing * Digital Signal Processing * Statistical Signal Processing * Adaptive Signal Processing * Multidimensional Signal Processing * Mobile Signal Processing * Optical Signal Processing * Real Time Signal Processing * Higher Order Statistical Analysis * Cyclo-Stationary Signal Analysis * Fuzzy Logic Applications in Signal * Processing * Neural Networks for Signal Processing * Applications in Telecommunications * Industrial Applications * Other Applications; 2) IASTED International Symposium on Acoustics, Speech Processing, and Applications (ASPA 2007) - * Audio and Speech Processing * Speech Analysis * Speech Synthesis * Speech Recognition * Speaker Verification * Speech Coding * Speech Compression * Speech Enhancement * Echo Cancellation * Voice Control * Speech Quality * Speech Processing Software * Human-Computer Interaction * Neural Networks * Soft Computing * Acoustic Modelling * Acoustic Imaging * Acoustic Signal Processing * Physical Acoustics * Structural Acoustics * Acoustical Oceanography * Spoken Language Interfaces * Synchronization Techniques * Speech Processing Devices * Multi-Lingual Speech Processing * Natural Language Processing * Machine Learning * Speech Translation * Visual Speech Perception * Animation * Computer Vision * Fuzzy Applications * Artificial Intelligence * Knowledge-based Processing * Hydro Acoustics * Architectural Acoustics * Engineering Acoustics * Bio Acoustics * Aero Acoustics * Sonar Detection * Ultrasonics * Noise Control Applications; 3) IASTED International Symposium on Image Processing and Applications (IPA 2007) - * Image Coding * Image Compression * Image Enhancement * Image Restoration * Image Segmentation * Image Representation * Pattern Recognition * Multi-Resolution and Multi-Spectral * Processing * Tomographic Reconstruction * Motion Detection and Estimation * Object Tracking * Image Sequence Processing * Content-based Image Retrieval * Image Databases * Computer Imaging * Radar Imaging * Sonar Imaging * Medical Imaging * Magnetic Resonance Imaging * Seismic Imaging * Color and Texture * Image Display and Printing * Image Quality * Video Processing * Video Coding * Video Streaming * Multimedia Processing * Digital Image Processing * Watermarking * Image Visualization * Remote Sensing * Sonar Imaging * Artificial Intelligence Applications * Neural Networks Applications * Fuzzy Logic Applications * Computer Vision * Other Applications.